Air transport allows people, mail and goods to travel above the landscape. The State’s topographical arrangement of coastline, ranges and rivers has determined the routes flown by regular public transport airlines, regional airlines and air service and charter operations since the 1920s. Distance dominates, but air transport has allowed speed to overcome that distance, at a price. Two air service route patterns developed and they remain current today. The first is the coastal aerial route from Brisbane to Cairns. It is service-oriented and has strong links to the tourist industry. The second consists of a web of regional and inland sectors that have catered in a constantly adaptive way for the needs of the State’s pastoral, mining and service towns and its isolated communities. Former World War I pilots saw opportunity in the fledgling air transport industry. Between 1929 and 1933, thirteen aerial service companies were formed in Queensland. Only two survived. Without subsidies, such as those for the carriage of mail, passenger air service operations could not be sustained. During the interwar years at least four companies tried the Brisbane-to-Toowoomba route. 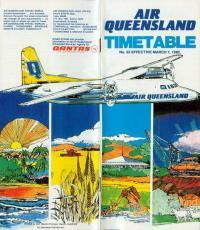 One was the Queensland and Northern Territory Aerial Service (Qantas). Hudson Fysh recalled in Qantas Rising, ‘Business was very good at first, but alas consisted mainly of the curious, and not of regular travellers.’ The regular travellers on this comparatively short journey travelled by train. The airfare was more than double that of rail and the time saving minimal. Overcoming distance and isolation in regional and outback Queensland, however, was another matter. By comparison, Queensland Aerial Navigation Ltd (QAN), commenced operations on the coastal route from Brisbane to Townsville in March 1930. Well equipped but unsubsidised, and in competition with the coastal railway route, QAN ceased operations after the loss of the Avro Star of Cairns near Maryborough the following December. Businessman GA Robinson’s New England Airways later found success with the Brisbane-to-Townsville route. Underwritten by contracts for the delivery of newspapers and mail to coastal towns, in 1935 the company changed its name to the more aspirational Airlines of Australia (AOA). Qantas opened its first city office in Brisbane in 1931. From this vantage point the company looked beyond Queensland horizons. In 1934 Qantas Empire Airways (QEA) initiated the Brisbane-to-Singapore sector of the first, regular, subsidised airmail service to England. To maintain the competitive edge of speed over the vast distance of landscape, QEA and AOA purchased the newest aeroplanes available – de Havilland Dragons, Stinsons and later Douglas DC2s – and expanded through corporate buy-outs, partnerships or mergers. Subsidised operations especially were subject to take-over by the larger airline companies. North Queensland Airways, a local company connecting Cairns and Cooktown with Townsville, became part of AOA, as did Rockhampton Aerial Services. With air transport developing nationally, it was only a matter of time before the operations of AOA were integrated into the larger Melbourne-based Australian National Airways (ANA) network. While still retaining its outback Queensland routes under the Qantas banner, QEA pursued an international future as a participant in the global airline network. Despite increased acceptance of air travel as reliability and safety improved, aircraft still made unscheduled contact with the solid, unforgiving surfaces of Queensland. 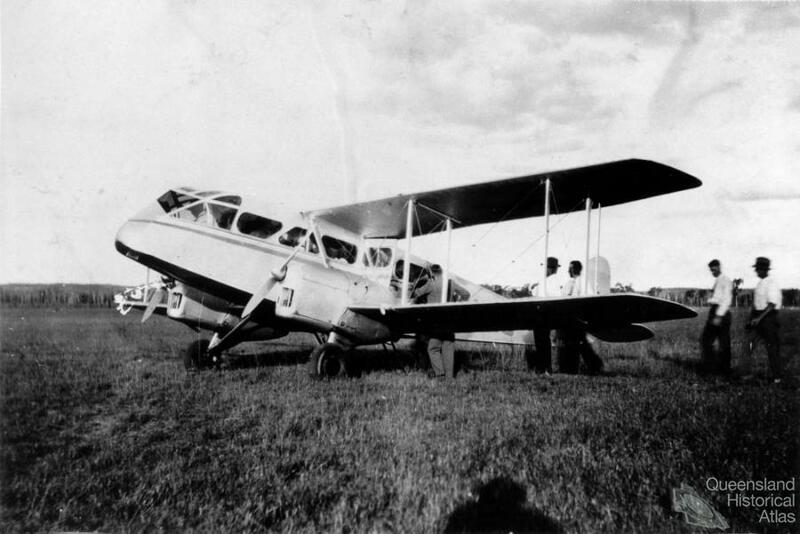 In June 1936 an AOA Monospar was forced to land after dark near Beaudesert. The only injuries were to the collarbone of the Federal Minister for Health, W.M. Hughes. Less than a year later, and within a six-week period, AOA lost two of its new Stinsons in fatal air crashes. The survivors of the February 1937 crash of Stinson VH-UHH in the MacPherson Ranges were found ten days later as the result of an astonishing feat of endurance by bushman Bernard O’Reilly. For airline companies and their passengers, a single journey sometimes could bring good fortune, despair or both. Queensland’s proximity to the Asian and the Pacific theatres during World War II turned its citizens into potential passengers who were more airminded and more desirous of seeing their State at a speed faster than the land-based networks of road and rail allowed. Many men and women in the armed services had their first experience of flying during the war. From the late 1940s, air service companies jockeyed for primary positions in the new travel market. Available for their use were ex-military pilots and former wartime aircraft such as the Douglas DC3. Hoping to find a tourist-based niche, in the late 1940s Barrier Reef Airways introduced flying boat services to north Queensland island destinations. Before long its operations had been merged into the expanding Ansett transport industry group. Aircrafts Pty Ltd, Brisbane based since 1927, changed its name to Queensland Airlines Pty Ltd and continued to deliver newspapers and passengers to towns north and west of the capital. In 1966 it too became part of the Ansett group. In accordance with the Two Airline Policy, key Queensland routes after 1950 were operated in parallel by the major airlines, Trans Australia Airways (TAA), the national airline formed in 1946, and the merged Ansett-ANA. With QEA now considered the national carrier, TAA inherited the regional Queensland routes previously flown by Qantas. Turbo-prop aircraft replaced the aging DC3s from the 1960s. Fokker Friendships introduced the comfort of pressurised flights to the major routes, until they too were made redundant by jet aircraft. At lesser altitudes twin-engine aircraft, operating to fixed and published timetables, catered for isolated communities and regional and remote towns. Mail and goods were delivered each week by air to remote pastoral properties. TAA (later Australian Airlines) and Ansett-ANA (later Ansett Airlines of Australia) dominated the key routes. The federally funded Remote Air Services Subsidy Scheme, with operating shortfall assistance from the Queensland government, provided subsidised services where there was no suitable alternative form of transport. Queenslanders became familiar with the names of the newest operators: Sunstate, Bush Pilots Airways (later Air Queensland), Flight West, MacAir and QantasLink. Like the interwar air service operations, some of these are now names of the past. In the 1980s and 1990s air travel truly overcame distance. Ordinary people commute by air to work in mining towns and camps, or for government or business purposes to the population centres and communities of regional Queensland. They fly when time is of the essence for personal and family reasons. On vacation they spend time in coastal and northern tourist centres instead of on the road. To achieve this ease of movement air transport companies have paid a price, generally financial, at times in lives. When administrators were appointed to wind up Ansett Airlines in September 2001, over 10,000 staff eventually lost their jobs. Some found employment in the Virgin Blue airline group, which began flights in August 2000, having been courted by the Beattie government to select Brisbane for their head office. Both Virgin and Jetstar, the Qantas low-cost subsidiary, which took to the air in May 2004, are vital for servicing the interstate holiday market in Queensland, with flights to all the major coastal airports, from Coolangatta to Cairns. Over the last ten years, especially with the growing popularity of booking directly on airline websites, the real cost of air travel has decreased markedly. All the major airlines are now listed on the stock exchange, and most of the major airports, once owned by the federal government, have been sold off to private consortia. Air transport in Queensland never has been an industry for the faint-hearted. For those involved, it has meant vast horizons, tantalising opportunity and sometimes despair. In that way, perhaps, it too reflects the landscape.